[vc_row][vc_column][vc_column_text] Choosing the best night cream for you face and skin is an important topic to consider. Night creams are designed to provide moisturizing support to your skin to help it rejuvenate and invigorate while you sleep. Night cream application should be a daily process. Applying night cream is a simple satep by step procedure that becomes second nature after a little while. First you clean your face of all makeup and other lotions using a skin safe cleansing soap and water. Pat your skin dry and then using a small dab of Dream Cream apply the night cream before bedtime to entire face, neck and chest. (As a side benefit Dream Cream can be used after any serums or treatments you currently utilize. If using as a day cream during the day, apply GENIE Dream Cream first (letting product fully absorb) before applying 3 pumps of GENIE Instant Line Smoother. Moisture: This is the main ingredient your skin needs and most people lose. Moisture within the upper layers of your skin provides buoyancy, lift and a young tone to your skin. All of the following benefits are primarily derived from this one aspect of night cream… moisture. Soothing and complexion: night cream provides a soothing and cool feel to your skin and evens out your complexion. Boosts collagen in your skin. Returns elasticity and aids in the hiding of fine lines and wrinkles. Night cream is beneficial to your skin due to the natural renewal process we all undergo during sleep. While we sleep our bodies repair and heal the damage of the day. You face is front and center as it is hit with everything you can be thrown at during the waking hours. A solid and effective night cream will provide the added moisture and ingredient support for the better healing of your skin. 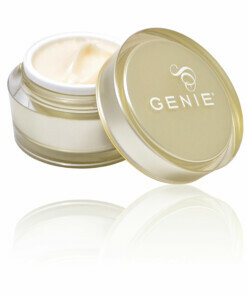 A night cream should have moisture trapping ingredients that draw in and keep moisture where you want it… on your skin. When applying the Dream Cream night cream many women (and men) note the cool feel and silky smooth texture their skin takes on. This is directly related to the effect of the ingredients on your skin as they draw moisture in and provide the nourishing surface you seek. When targeting your skin with a night cream it is important to use products that have been widely tested and proven in the market.